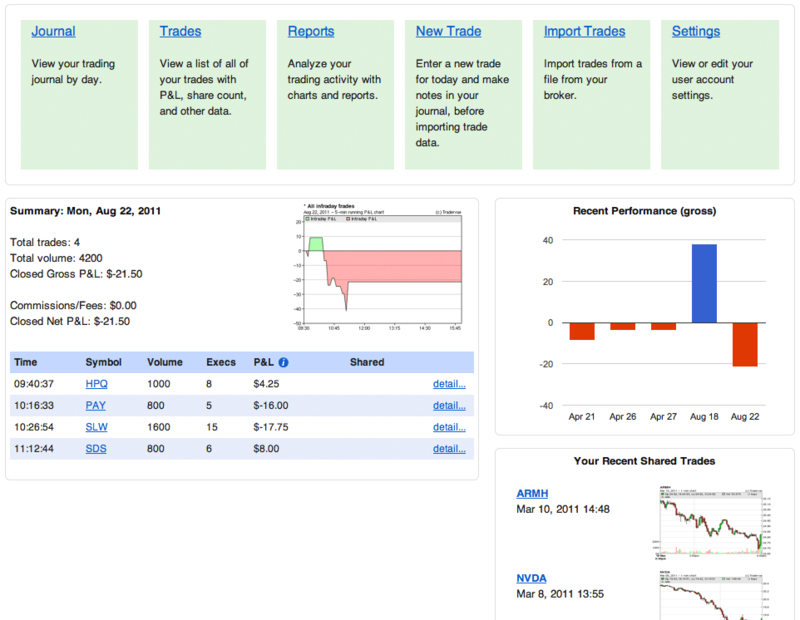 As the latest in a series of new broker and platform support, Tradervue now supports import from Scottrade! 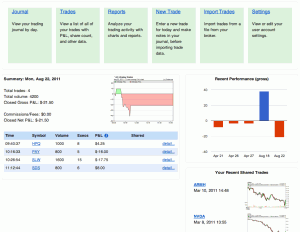 Just sign into Tradervue, click on Import Trades, select Scottrade, and follow the instructions. If we don’t support your broker or trading platform, be sure to let us know at support@tradervue.com and we’ll try to get it on the list. 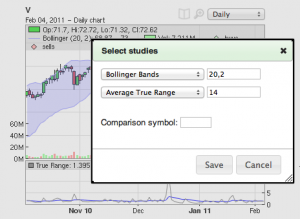 Tradervue now supports import from DAS Trader Pro. 1. DAS Trader Pro only allows you to export executions for the current trading day. So make sure you export before about 10pm eastern each day, or you may not be able to at all. 2. When importing into Tradervue, there is a field for “Trade date for this import” – you need to fill that in with the trade date for the imported trades. This is because DAS Trader Pro does not include the date in the exported data – only the time. To do your import, just click on Import Trades, select DAS Trader Pro from the list, and follow the instructions. Export is available for all silver and gold subscribers. One new broker this week wasn’t enough, so we just added import support for TD Ameritrade. After you sign into Tradervue, just click “Import Trades”, select TD Ameritrade from the list, and follow the instructions. For Thinkorswim users, we still recommend using the Thinkorswim importer…but for everyone else on TD Ameritrade, this is for you! 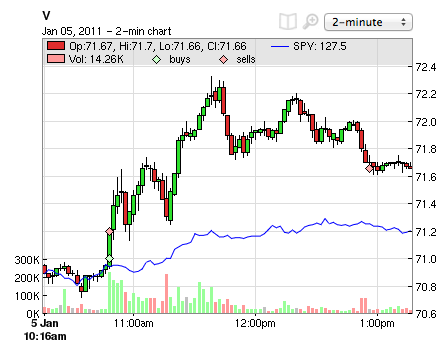 This one has been a long time coming…but we finally have support for E-Trade built into Tradervue. The problem has been that there isn’t a way on the E-Trade web site to create a report that lists your trade executions in a way that includes the actual time of the execution. Hard to believe, I realize, but we even confirmed this with E-Trade support. But, a clever Tradervue customer named Rob noticed that the trade alerts window actually contains all of the necessary information (thanks Rob!). So, you can import all of your trades back to the last time you cleared your alerts. So, to import from E-Trade, just select it from the drop-down list on the Import Trades page, and follow the instructions shown. 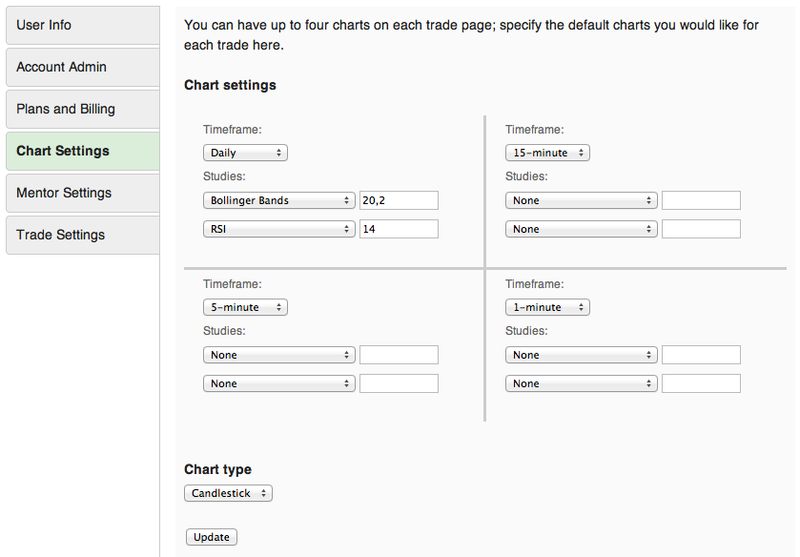 Also new in the recent Tradervue update was an all-new Dashboard, which is the default page you’ll see after logging in. At a glance you’ll see your most recent trading day details, your overall performance for the last week (or the last 5 trading days), and your most recent shared trades with comment notifications. 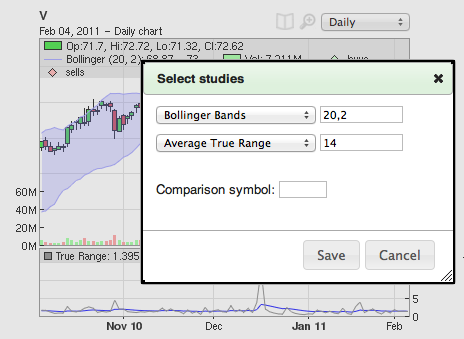 It looks at your last two trading days, and alerts you if there are shared trades in the same symbols on the same days. 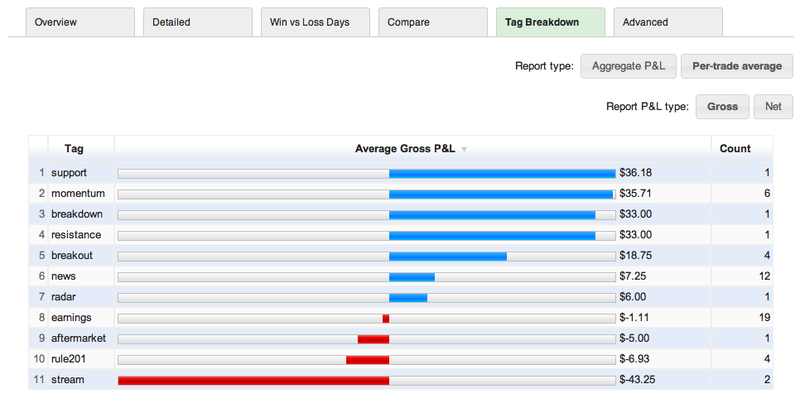 It shows you each of your tags, along with the number of trades using that tag and the total or average P&L for each of them. If you’re using tags for the setups you’re trading, for example, then it’s easy to see very quickly which setups are working this week, and which ones aren’t. I’ve spoken to several folks who have sometimes been surprised; they thought a setup was working ok, but in reality it was responsible for the largest losses of the week/month/etc. 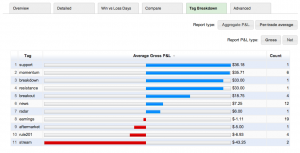 When combined with the trade filter, this new report makes that information quickly available. The tag report is available to all silver and gold subscribers. This shows your trading performance based on the type of movement in the overall market that day, be it trend day, range day, etc. This report may offer some unexpected insights into your trading! 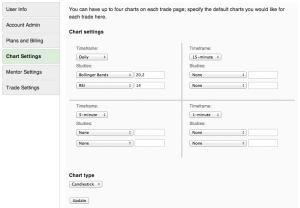 This report plots all of your trades matching the current filter, by the duration of the trade. An easy way to tell, for example, if the trades you are holding longer are performing better. 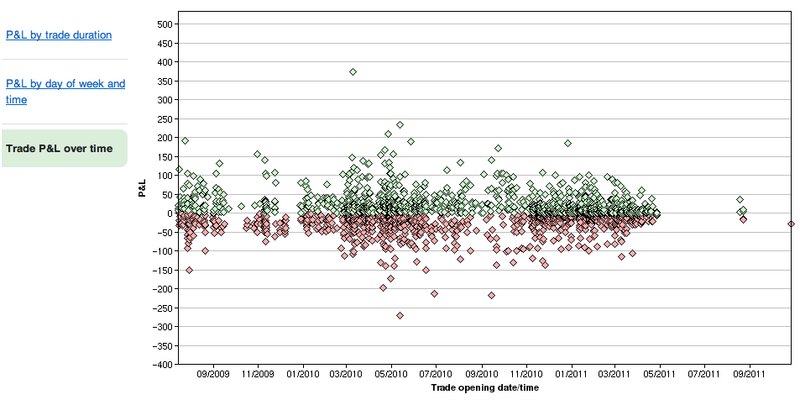 This report plots your trades matching the current filter against the day of week and time of day they were placed. This one is particular interesting for folks trading futures, not necessarily limited to the regular daily trading session. This report plots your trades matching the current filter against the date and time they were opened. You can look at an overview as shown above, or zoom into just a single day or week and see your trades based on time of day. There will be more of these types of reports coming – let us know if you have ideas as to what you’d like to see! 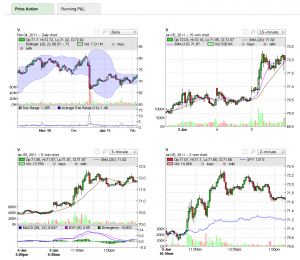 With this week’s release, Tradervue now supports adding studies and comparisons to the auto-generated price charts for silver and gold subscribers. If you normally use, say, an EMA(20) on the 5-minute chart when you’re trading, then you can see the same in your journal when you’re reviewing later. If there are studies you need, but they’re not on the list, let us know and we can likely get them added for you. The price for the comparison symbol is normalized to the symbol you’re comparing it to, so they will fit nicely on the same chart. 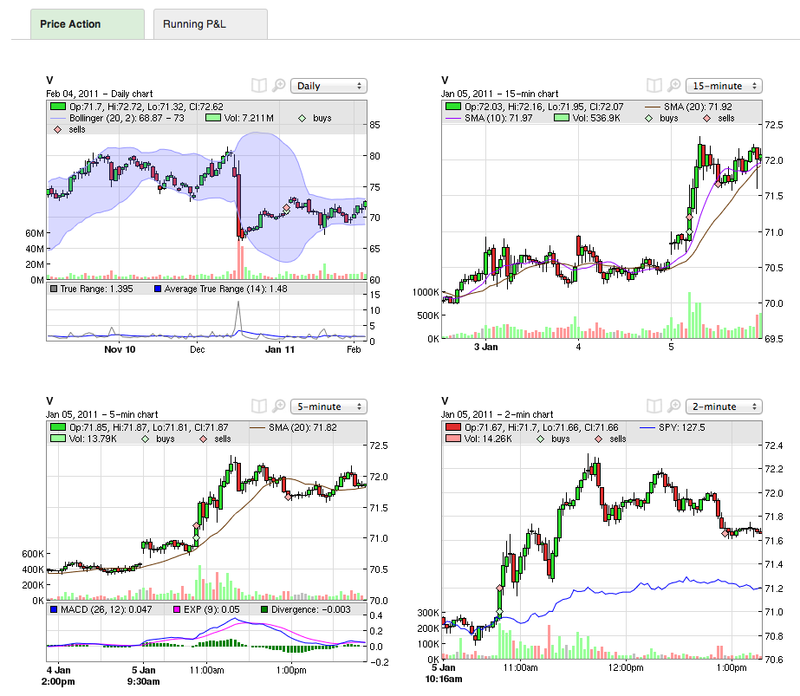 You can use the comparisons with markets, sectors, other stocks/futures, or whatever you like!